BMW 5 Series Touring vs Jaguar XF Sportbrake | What Car? This excellent estate is cavernous and plush. It has beaten all in its path so far. Jaguar’s latest wagon promises the same brilliant handling as the saloon it’s derived from. Take a stroll through the Bavarian countryside at this time of year and chances are you'll be faced with damp conditions and longing for a warming Bratwurst. Transport in such conditions doesn’t come much better than a four-wheel-drive version of another icon of Bavaria, the BMW 5 Series Touring. It’s currently the best premium-badged estate car you can buy, thanks to its cosseting ride, cavernous boot and tidy handling. 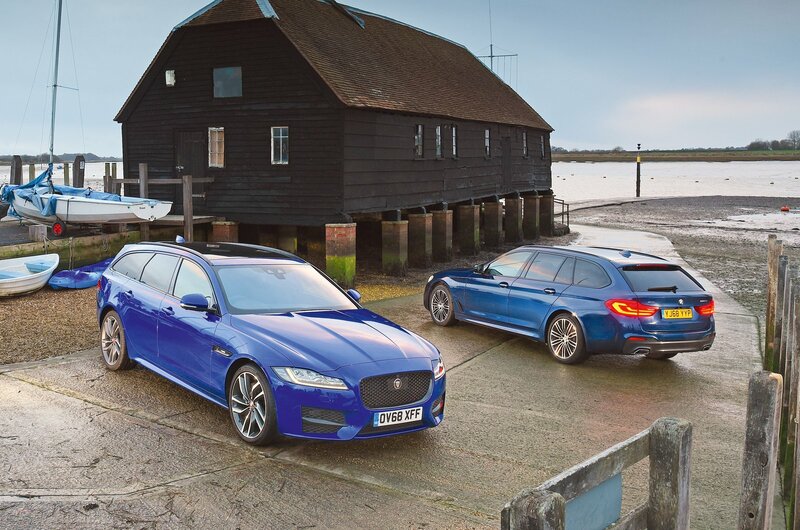 But now it faces a new rival: the Jaguar XF Sportbrake. The British brand’s new estate appears to have every chance to take the 5 Series’ crown, with impressive practicality, a powerful engine and, if the XF saloon is anything to go by, entertaining handling. The 25d version of the XF we’re testing here also has four-wheel drive as standard, making it a great match for the 5 Series xDrive, especially since both cars also have 2.0-litre diesel engines and automatic gearboxes as standard. Start the cars and you’ll immediately notice a difference. While the 5 Series’ diesel engine gently stirs into life and thrums away in the background, the XF’s coughs and splutters in a rather more agricultural manner. In fact, refinement is a real strong point for the 5 Series across the board because, as well as substantially less engine noise, there’s less wind and road noise at faster speeds. But it’s not all about how these cars isolate you from the outside world. 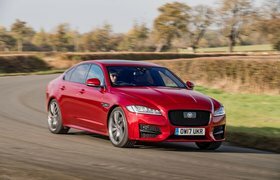 Both accelerate off the line in similarly grippy fashion, and it’s only in flat-out acceleration that the XF’s extra 50bhp becomes noticeable as it starts to pull away. The 5 Series isn’t remotely sluggish, but overtaking is quicker and easier in the XF. Both cars actually employ the same eight-speed automatic gearbox, but it's better integrated in the 5 Series. Here its shifts are always smooth and slick, whereas in the XF it dithers more when pulling out of junctions or onto roundabouts and generally seems less certain about which gear it ought to be in. 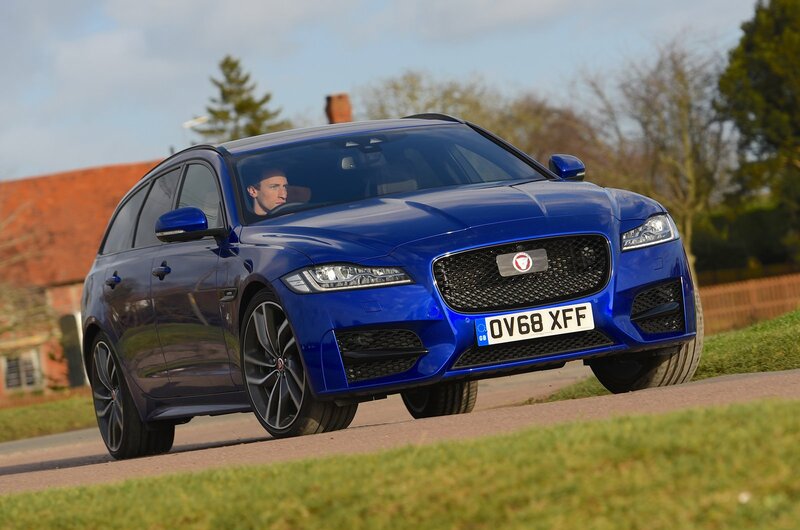 The XF has the edge when it comes to handling, though. Its steering is noticeably sharper and the car generally feels a bit more agile than the 5 Series, staying more upright through corners. But the 5 Series is still incredibly grippy in the bends, and it feels more composed and planted on the motorway. Meanwhile, both cars’ four-wheel drive systems ensure there’s plenty of traction on snaking roads, even in bad weather. 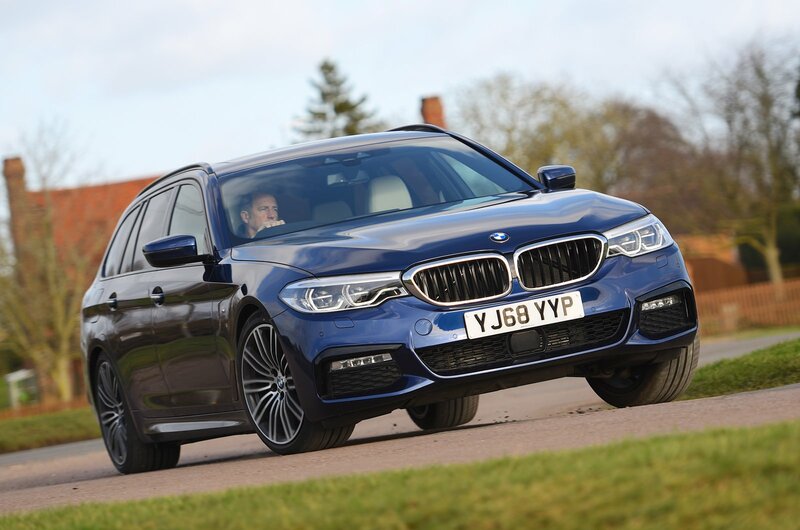 Both of these estates ride well by class standards, too, but the 5 Series is more cosseting, especially when fitted with BMW's £985 Variable Damper Control system; it takes a pretty big pothole to unsettle it. The XF actually copes with these sort of harsh road imperfections slightly better, but the flipside is a firmer, less relaxing ride the rest of the time.